I’ve been thinking about the terrorist attacks in Paris all weekend. It breaks my heart, all this hatred in the world. My deepest sympathies to the family and friends who lost loved ones and to all the people of France. I grieve with you. I rode 65 miles/104.6 kms yesterday and it was really amazing to see the support for France offered up by the other cyclists. We all have our country’s flags that appear with our names on the rider board and people riding in France were deluged with “Ride on” thumb’s up. One rider even commented on how wonderful the support was. Many riders added “PFP” or #France or some other tag after their name. There was even talk of having a group ride against terrorism. It was a supportive communal kindness I did not expect to find in an online virtual cycling “game” and it made me glad to be part of it. This morning Bookman was out working in the front yard cutting back perennials for the time when the snow arrives. Even though it was close to 60F/15C today, the cold and snow will eventually descend. And since I do the snow shoveling I can tell you it is a giant pain in the backside to have the dead perennials and grasses flop over onto the sidewalk and freeze there. Unfortunately Bookman’s hard work gave him a pain in the back and he barely made it into the house before he was hit with a big spasm. He sprawled out on the floor just inside the door and lay there until the worst of it passed. I got the heating pad and arranged pillows on the couch and stood at the ready to lend a hand as he slowly struggled to get himself upright. Water and ibuprofen soon followed. Gradually his back began to feel better and he was able to get up and carefully move around. 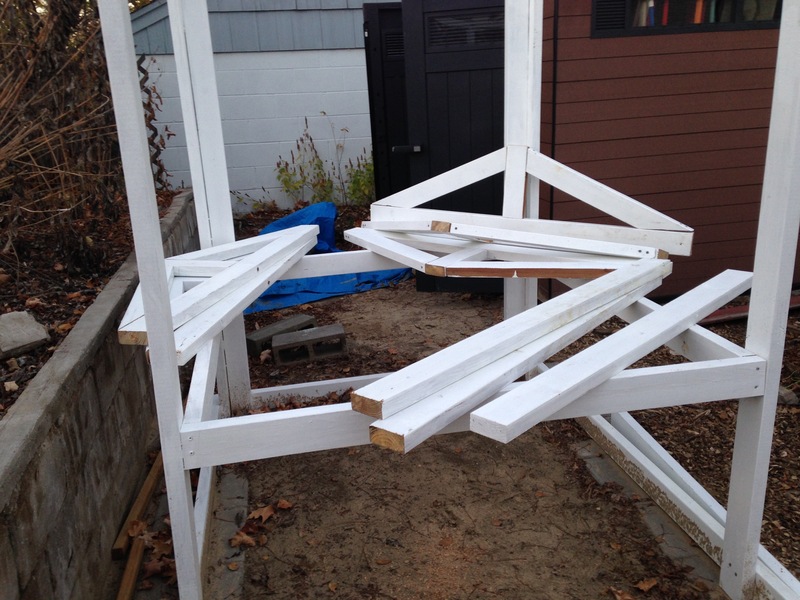 We had plans to do the rafters on the chicken coop today and it seemed as though they were in jeopardy. However, not long after lunch Bookman decided he wanted to give the rafters a try, he needed to move around. I did all the bending and lifting and ever so carefully we managed to not only cut all the boards to build the rafters but we put all five of them together too! Five rafters ready to install! I must say we both feel rather proud of ourselves and like we accomplished something really big. The rafters are not up on the coop itself yet, I can’t lift them up alone and Bookman was in no condition to do any lifting anyway. So getting those up will be for next Sunday which will not be nearly as nice as it was today. It appears the weather shoe is about to drop and by mid-week we will be crashing to seasonal temperatures — hard frosts at night and daytime highs only a few degrees above freezing. As long as there isn’t snow we’ll keep working. And now for something a little different. I’ve been thinking for a few months about wanting to try my hand at essay writing. I am not keen on the idea of writing an essay and then flogging it around to different websites or magazines trying to get it published. Nor do I want to purposely write commercial pieces with a specific audience or publication in mind. I just want to write essays on whatever I feel like. I read an article at The Guardian the other day about how the internet is an ideal home for the essay. And I thought, hmm, what if? I haven’t made it past the idea stage to execution stage yet, but my plan is to create a separate website from this blog for the purpose of essays. I’d like to aim for two a month but I don’t know if that is too ambitious. It seems like it might be. I am thinking it would be good if the site were more active than just one or two essays a month from me, and wonder if any of you might be persuaded to write an essay? It could be a one-off or perhaps you enjoy essay writing so much you might want to write a few. In my mind, I am thinking posting one essay a week would be pretty decent. Topics will not be limited to books. My intent is a site for personal essay writing to explore whatever strikes my — or possibly your — fancy. What do you think? Even if no one wants to contribute an essay I will still be moving ahead with it for my own personal experiments in writing. It could be a wild success or a terrible failure. But to me, essays are all about the process, the attempt, as the word “essay” implies. I don’t know when I will have this new venture up and running, but it is in the works and I already have begun a list of things I want to write about. It’s a little scary, a leap into the unknown for me, but no matter what happens, I’ll be glad I at least tried. Richard, that would be wonderful! I understand about Paris. We’ll see when I get the site up and of course, there is never a hurry on your part! I think of some of my blog posts as essays, especially the ones that feature a poem. But I’d be willing to contribute to your essay blog, maybe branching out to thoughts on something non-literary. Do I have any non-literary thoughts? Not sure! You come up with ideas that have been stewing in my mind for some time. i have been trying to write a little more accademic stuff lately…not particularly an essay, but stuff which can be turned into an essays which are different from my blog posts. I am kind of worried and concerned if they would be good or not, but am willing to give it a try, so count me in! P.S. Hope Bookman is feeling better! It is terrible what has happened to France, but I also feel that the attacks in Beruit and Kenya are equally horrifying! Terrorism is ripping the world apart and I am not sure when and how we will be able to conquer it! cirtnecce, wonderful! It’s good to try something new and I totally understand your worry because it is mine as well. Bookman is on the mend, thanks! You are right, terrorism no matter where it happens is horrifying. Hi Stefanie. What a great idea – I’ve been trying to combine book reviews with mini-essays on my blog, although so far I haven’t curated it very clearly! Anyway, I really look forward to reading yours, and would love to contribute, too, if that’s any help. I was really touched by your words on Paris, too – they articulate what I haven’t been able to. That is a fascinating idea and seems a natural progression perhaps for you to make from your Monday dispatches. Good luck with it! Also touched by words on Paris because it is so difficult to know what to say. Ian, thank you. It is difficult to know what to say about Paris. Words are hard to find at times like these. As for my essay project, it seem a kind of natural progression. Thanks for the good wishes! widget, thanks — for everything. We rely so heavily on words but at times like these words never seem enough. I wanted to say something but struggled with what so I am glad what I managed touched you. Elle, you gave me a good laugh. Thanks! I think now I said something about it I will have to do it and see what happens. I’d be interested in joining in your project. It sounds really really fun (and low pressure) – my sort of combination! 🙂 Love the idea and thanks for the global invite. ravingreader, fabulous! Definitely low pressure, who needs extra stress? I would love to read anything you craft. Some of your blog posts are pretty much essays, right? Not sure I know the difference. I think it is a marvelous idea. On another note, I thought of little else than Paris all weekend. Another era of turmoil…another bad moon on the rise…I don’t know whether it will ever end, but it is all so very sad. Yes, another era of turmoil. But I don’t think there has ever been a time when there wasn’t turmoil somewhere in the world. I am hoping that somehow everyone who feels sad about it can somehow be a force for the positive and move us toward better times. I think the most terrible thing about Paris is that it is not as shocking as the Charlie Hebdo murders. We have become accustomed, not immune, but accustomed to this kind of senseless horror. Charlie Hebdo had me in shock; this outrage has sent me into a kind of depression. Your essay idea sounds intriguing. I do love reading essays. Jenclair, I wouldn’t say accustomed, more like not so very surprised, but I know what you are getting at and it is sad but true. And yes, I skipped right over shock and went to a kind of depression too with this latest attack. Glad you like the essay idea! Paris was so awful. The only good thing to come out of it is this sense of international sympathy and community. And given all the divisions ISIS causes globally, we really need it and to keep our eye on how important and significant it is to stick together on this one. I am so sorry to hear about Bookman’s back – youch!! I do hope he’s moving better now. And your idea of an essay blog is a fantastic one – can’t wait to hear more about it! litlove, you are right, there is more of an international community that seems to be emerging from the Paris attacks, something that is definitely needed. Only I am also afraid it is making life even harder for all the poor Syrian refugees who are caught in the middle of it all. As if it weren’t bad enough already, now everyone is scared of them. Bookman’s back is still a bit sore and stiff but he is recovering well, thanks. The Chiropractor thinks his frequent back trouble might be MS related due to weakening muscles. I think that news has made Bookman more inclined to go to the gym with a little more frequency once he can manage it. If ever I would find one of my essays good enough to publish I would be so honoured to find a home for it on your planned new website. Good to hear Bookman’s back improved during the day. I hope the chiropractor did help too. Paris. Another tragedy so close to home. It touches on the barely covered scar of Charlie Hebdo, on the grief for flight MH 17. What can I say. Cath, I would love to have one of your essays and I can assure you, they are good enough to publish! The chiropractor helped a lot and he is slowly feeling better, thanks! The tragedy never seems to end. It is very hard these days to not get caught up in great and sinking sadness. I’m so impressed that you’re building your coop from scratch, not a flat pack. I’ve been busy cutting back perennials too, although some I’m keeping uncut because they stand up well to the frost and look great when covered with it. I hope Bookman’s back is better and I think your essay idea is a great one. piningforthewest, we looked into kits but they were so expensive and none of them were quite right so we figured, how hard could it be really? Plus the sense of accomplishment is so much greater doing it from scratch! 🙂 I leave some perennials standing too and they look nice until they get buried under the snow! Bookman’s back is on the mend, thanks! And thanks for the essay encouragement! All this hatred in the world. Yes, yes, yes. It starts with ridiculous little things like road rage, giving people the thumb, right up to terrorist and other brutality enacted be humans on other humans. I really don’t get it. Maybe my life has been too easy – but even in an easy life you can choose to love or to hate, to be kind or to be cruel and rude. Enough. Essays. Oh I do love an essay. I have a few draft posts which are really more essays, and hence they are still drafts! They are ideas I’ve had, literary-based, and have popped down but haven’t actually found the time to do the extended thinking to build those ideas into something fuller or more complete. Go for it. As for contributions? I assume you’d be happy with cross-posting? Not promising anything the way my life is going, but just thinking. whisperinggums, I don;t get it either. I mean, I understand getting angry and doing something stupid, we’ve all done that, but hate? Maybe my life has been too easy too because I just don’t understand. With so much encouragement how could I not do the essay site now? I would love to have something from you and yes, of course, cross-posting is fine! This is good timing! I’ve actually been thinking about finding a way to do some non-bookish, personal writing online. But, like you, I don’t want to shop it around or try to fit a particular publication’s requirements. I’ve looked into Medium as a venue and contemplated setting up a separate personal blog, but I haven’t gotten beyond the thinking stage. So I’d be happy to join in this project! Teresa, it is interesting how many have commented that they have been thinking about something similar! I wonder if blogging for a long time sort of leads one to want to expand out into trying something a little different? With so much interest, I had better get moving from thinking to doing! Oh neat! I hope this comes to fruition, especially if some of the wonderful people who have commented here do end up writing essays to include on the site ALSO. I’m shy and would probably wait to see what other people wrote before I took on writing an essay, but sometime in the future, I would totally be willing to try!